Revive!’s newest franchisee is embarking on his fourth major career change at an age when many people are looking forward to retirement! Graham Cunningham (64) began his working life as a policeman in Derbyshire before leaving the force to take on the Lada and Proton dealership in Halifax. When the manufacturer pulled out of the UK Graham re-trained to be a naturopath therapist specialising in NLP, Hypnotherapy and reflexology. 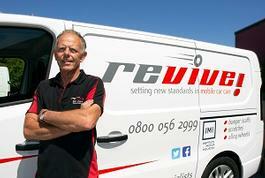 In this video you can hear from Revive franchisees on why they chose to buy a Revive franchise. You can see some of their franchisees in action, giving a good indication of the role of a Revive franchisee. Over 150 Revive! 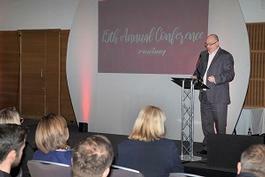 franchisees and technicians gathered at the home of England football, St James Park, to attend the company’s 15th annual conference and celebrate a year which saw an almost 50% increase in demand for the UK’s leading network of accredited SMART repairers. Revive! is a multi-award-winning franchise offering a tried and tested route to building your own successful multi-van smart repair business. Could you be our next sucess story? To find out more, why not request our FREE & non-obligatory franchise prospectus. If you are looking for the best management business opportunity in the UK, please do your due diligence on us, we promise you won't be disappointed! By filling in the form below you will be able to receive a copy of the Revive! Auto Innovations prospectus.